To promote her new film ‘Private Life’, Emily Robinson attended the premiere during the 56th New York Film Festival yesterday(October 1st) in New York. 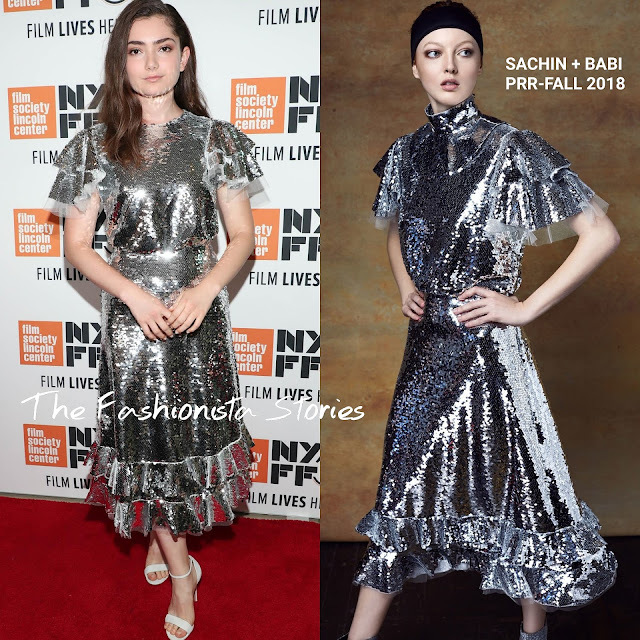 She sparkled on to the red carpet wearing a SACHIN + BABI PRE-FALL 2018 silver sequin dress, featuring ruffle, tulle sleeves and a two tier ruffle hem. In the look book, Emily’s dress featured a turtleneck detail but I prefer the dress without it. Beauty wise, she kept it very simple with light makeup and side parted tresses which topped off her look along with white sandals.